Small orders can kill your bottom line. So do YOU have a problem? Here’s how to check. Will larger orders cost less than smaller ones? Some of you will know that I have a ‘thing’ about cost to serve and seem to talk about it at the drop of a hat. “Maybe that’s all he knows about” you might be thinking? Well, the simple reason that I sound like a broken record sometimes, is because so many businesses just don’t seem to ‘get it’ when it comes to understanding their supply chain costs and those businesses are just throwing money down the drain. Margins are falling and supply chain costs seem to be escalating out of control. 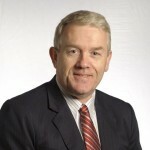 They’re focussed on the big stuff; the new systems implementations and staff restructuring, but they’re oblivious to the undercurrents of poor Supply Chain performance that are eating away at their profits like a plague of white ants. They suspect there’s a problem in their order processing costs, but they just can’t nail it. They don’t have the visibility of costs and performance to see where the problem lies. Now the good news is; that gaining that performance visibility didn’t need to involve a huge expense in systems and analytical staff. They solved the issue quite simply and inexpensively. In fact, it’s something you can do yourself, on a spreadsheet! Would you like to know how? Well here’s the answer. Well part of the answer at least. So as to keep this article short and easy to read, I’ll start the ball rolling and add some more tips in the next bulletin on this very topic. So; the problem lay in the amount of small orders they were processing. They didn’t realise that 30% of their orders were leaving the warehouse with negative margin! Any gross margin having already been eroded by order processing and handling costs… Absolutely true! And I’ve seen the same thing in many businesses, large and small. They weren’t alone in this problem. So, if you don’t have visibility of this type of problem in your business, here are some simple tips to find out if you have a problem or not. Because Company X didn’t even know the problem existed! This is easy and can be done on a spreadsheet. Just do an extract of customer orders, showing the total value of the order and the gross profit margin per order. Then graph these from high to low. If you have a lot of transactions, maybe just do one month to begin with. You’ll be amazed at how many low margin orders you have! Sure the overall value of a customer has to be taken into account, but these low margin orders will be leaking margin unnecessarily. Now low margin orders in one company, might not be considered low margin orders in another. It all depends on the product value of course. So to get an idea of how bad this situation might be, you need to establish the costs involved in processing and handling an order. You’ll need to work out the order processing costs for the month and the warehousing and despatch costs for that same month. 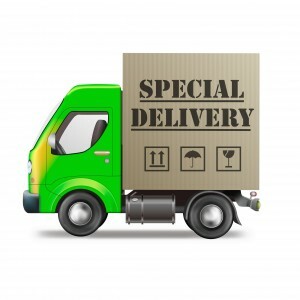 If you like, you can also add in the delivery transport costs, but that can be done as a next step. It’s the order processing and warehousing costs that are the key, because transport costs tend to have more of a variable relationship with the size of the order anyway. You won’t need to add in transport costs yet, just to find out if you have a problem or not. Now we need to get a view of how much it costs to process and handle an order. You have the total order processing costs and the total warehousing costs for the month. Make sure you have the total costs, fixed and variable. So not just the labour costs, but facility rental, materials handling equipment, consumables, labour and so on. All the costs. To do this accurately, we’d normally look at how long various products are stored and how much storage volume (or cube) they take up in the warehouse to accurately attribute storage costs. And in the same way, look at receipt, putaway and picking productivities to allocate a fair variable cost by product. But for your ‘back of the envelope’ calculation, try this. Allocating costs on an order basis won’t work because order sizes vary a lot. And allocating costs on a unit basis at the high level we are doing this, will just skew the results, as some items are far easier to pick than others. So try allocating costs on an order line basis. This is a good compromise that at least takes account of the differences in handling large and small orders. Remember, this approach is just a back of the envelope, to see if you have a problem or not. You can take a more detailed approach later if you need to. So here is a simple worked example. 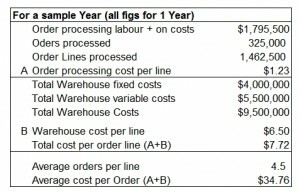 This is telling us that quite simply, our cost for processing x`and handling an order through the warehouse is $34.76. Now have a look at the chart above. 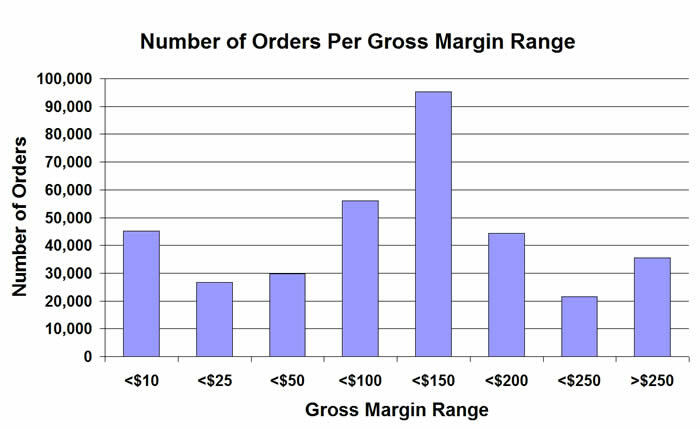 Almost 72,000 orders have a gross margin of less than $25. That means we are losing money on 72,000 orders before they have even left the warehouse! So YES. We have a problem in this case. OK, this is an extreme example just to show you the process. But I’ve seen many companies in just this position. Obviously if you think you have a problem, you then need to do this analysis at a much greater level of detail, to take account of how long various products are stored (storage costs), the variance between large orders and smaller orders (to better allocate variable costs) and of course the differing margins of the product range. But hopefully you get the idea. Just this simple back of the envelope analysis might highlight if you have an issue or not. And if you have a problem with loss making small orders, the answer is normally quite simple. Look at every way that you possibly can, to get your customers to place larger, less frequent orders. That is the easiest way to resolve the issue, even if it means offering bulk discounts. The trade off is generally well worth it! Watch out for more cost to serve tips in our next Bulletin. This is 100% impactful topic, Obyrne, thank you for this light shed on cost of processing and handling order, this is what gulp larger part of realisable profits if not well taken care of. Glad you found it useful Christopher. Cost to Serve analysis is a great way to identify cost reduction opportunities as well as profit improvement.